Don't get me wrong—I love Super Mario Odyssey. There's no denying the level of polish and care put into that game, and it truly is the best Mario game in years. It's just that there's this little indie game that's better. Now obviously, "better" in regards to video games is subjective. What one person loves another may hate. But my entire time playing Super Mario Odyssey, I couldn't help but wish it was actually another game; A Hat in Time. If you haven't heard, A Hat in Time is an indie 3D platformer by Gears For Breakfast. It draws inspiration from earlier Mario games such as Mario 64 and Sunshine (as well as other collect-a-thons like Banjo-Kazooie). Somehow this small team took the best elements of those games and built upon them to create a game that is more than a copycat. And since A Hat in Time is on its way to the Switch, many Mario fans are about to get their first chance to play it. Super Mario Odyssey has no shortage of imaginative and interesting moves, courtesy of Cappy's soul-stealing powers (which is a little creepy, when you think about it...) However, you can only hop into the body of an enemy when that enemy is present. This turns it into more of a level gimmick than any real progression. Aside from those, Mario doesn't change at all from beginning to end. A Hat In Time doesn't have a lot of ability progression, but it has some. In the beginning Hat Kid only has her iconic top hat, which points you towards the current goal. However, as you play and collect yarn you can stitch hats with new powers. One let's you run faster (which is what I wear 90% of the time), another let's you throw explosive potions, and one opens up shortcuts by letting you ground-pound springy platforms and soar across the map. That sense of gaining new abilities adds to the game, and although it's not necessary it's an area I felt Mario Odyssey fell short. This might sound strange—after all, Mario Odyssey boasts an enormous amount of Power Moons, scattered across a multitude of levels. But what it has in quantity it lacks in variety. You collect Power Moons to unlock new Kingdoms, you use coins to buy cosmetics (and a couple more Power Moons), and... that's it. On the flip-side, A Hat In Time has a variety of different things to collect. Time Pieces are that game's equivalent to Power Moons, and are used to open up new levels. Pons are similar to coins, but are used to buy badges that are actually useful. Yarn of different kinds is needed to stitch new hats. You need to find matching relic sets to open up new Time Rift levels. And tokens are hidden about, which are used for cosmetic upgrades. It seems blasphemous to criticize Mario Odyssey's controls. That game is highly regarded for the versatility in Mario's moveset. Not only can he jump, roll, and backflip better than ever, but the addition of Cappy allows for some seriously impressive moves in the hands of a skilled player. The problem is, I'm not that skilled. Beyond a few basics, most of Mario's moves went untouched my entire play through. That wouldn't be so bad, but the controls on some of those essential skills felt a little... off. The most obvious to me was the dive; you have to press ZL and Y together to lunge forward in the air. I use that dive all the time, but it never felt as natural as the same move in A Hat In Time. Hat Kid's moveset is simpler than Mario's, but it works better. She's got a wall jump, a double jump, and a basic attack. Diving midair is just left trigger, no added button needed. There's even room for mastery; for example, if you jump as soon as you land from a dive, you get a quick boost of speed. But for the most part, maneuvering Hat Kid is simple yet intuitive. I always felt in better control of her than Mario, and in a 3D platformer, that matters. Although this feature is unlikely to arrive on the Switch at launch, A Hat In Time sets a new standard for Co-Op in the genre. Letting a friend play is absolutely effortless; just plug in a controller, hit the Co-Op button on the menu, and Player 2 pops into the world as Bow Kid. Then you just... play. Bow Kid has all the same moves and abilities as Hat Kid, and the split-screen let's the two players go about the game however they please. It is an absolute joy to play together, and makes an already charming game infinitely better by sharing it with a friend. Mario Odyssey's Co-Op... is there. Player 2 controls Cappy, who can move around Mario knocking out enemies or hitting blocks. Although not terrible, giving Cappy free reign makes most of the game a cakewalk. And if Player 1 wants to do those advanced maneuvers? Without good teamwork Cappy is likely to just get in the way. Mario Odyssey's Co-Op feels tacked on, but A Hat In Time showed me just how much fun two players can have in these kind of games. A Hat In Time is chock full of memorable characters. There's the delightfully gruesome ramblings of Mustache Girl, Snatcher's over-the-top laughter, and the hilarious rivalry between The Conductor and DJ Grooves to name a few. The fact that most characters are fully voice acted only adds to their charm. These characters stuck with me long after beating the game, and on a second run I'd say their best lines alongside them (zany accents and all). Don't get me wrong—Super Mario Odyssey did a great job of expanding beyond the franchise staples of Goombas, Koopas, and Piranha Plants. The various kingdoms are populated by imaginative races. My favorite has to be the fork-folk of the Luncheon Kingdom. I commend them for reaching outside the standard Mario mythos, but those are still unnamed extras. None of them really stand out in a memorable way. The only characters who get any screen time are Mario, Cappy, Bowser, Peach, and maybe Pauline—and none of them are very interesting. Mario's headed in the right direction, but as it stands it can't top A Hat In Time's unforgettable cast. Another feature the Switch isn't likely to get right away, but one that has to be mentioned. A Hat In Time added official mod support, and in doing so opened the floodgates for some brilliant additions to the game. There are mods that add simple platforming levels—then there are expansive new levels that could pass as an official add-on. You can get cosmetic mods, weapon mods, or new ability mods. Heck, you can even replicate Mario's most famous accessories. I've equipped Hat Kid with a fully-functioning FLUDD pack, tossed Cappy around, all while exploring fan re-creations of places like Bob-Omb Battlefield, Hyrule Castle, and Freezeezy Peak. The point is, by embracing mods A Hat In Time has opened itself up to limitless possibilities. Real talk; Super Mario Odyssey needs some DLC. I mean, the occasional new cosmetic update is nice and all, but with such a finely-polished engine, why not add another kingdom or two as downloadable content? Breath of the Wild got two DLC, and if nothing else they were a good reason to revisit a great game. Mario Odyssey is also a great game, and I'd gladly pay to have some new places to explore. On the other hand, A Hat In Time already has its first DLC out (well, for PC anyway; console players are still waiting). The "Seal the Deal" DLC adds a new level and an extra-hard challenge mode. Although the new stage is shorter than most, the charm is turned up all the way to eleven, and I enjoyed every minute of it. And the challenge mode? Oh boy, that thing is no joke. The expansion was well worth it, and I wish Mario Odyssey offered something similar. Okay, okay; price isn't everything. I'm happy to pay full price for a good game, and Super Mario Odyssey is totally worth every penny. It's just... A Hat In Time is easily worth as much—but costs half the price. You can't go wrong either way, but you'll definitely get more bang for your buck with A Hat In Time. One of my pet peeves is when games don't offer multiple save files. True, you can work around this problem by using multiple profiles on the Switch, but why should you have to? It's 2019, data is cheap, and there's no good reason a game shouldn't let me have a separate save for my 100% challenge and my Co-Op with a friend. And if I want to do a second run of the game, I shouldn't have to overwrite my late-game save. A Hat In Time has more than enough save files. I don't know exactly how many, but I currently have 5 and it still offers the option for another—which is exactly how it should be. There's something to be said for a familiar franchise—and it doesn't get more iconic than Mario. But in a day and age where almost everything is a reboot or remake, it's refreshing to see something new that holds its own next to giants like Mario. True, A Hat In Time draws inspiration from games of the past, so it's not completely "original." But it blends those ideas together beautifully to create its own identity. It's a tribute to those games, but it never tries to be them. 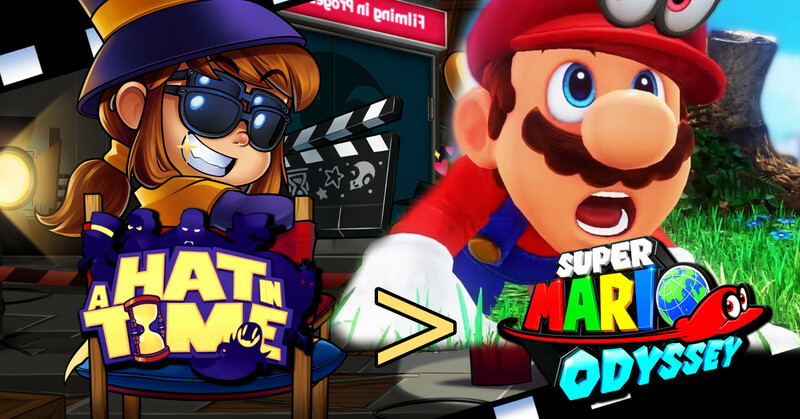 So if you're a Mario fan, you owe it to yourself to check out A Hat In Time. Who knows—it might even turn into your new favorite platformer! You can find out more about A Hat In Time at their official website, as well as by following them on Twitter.